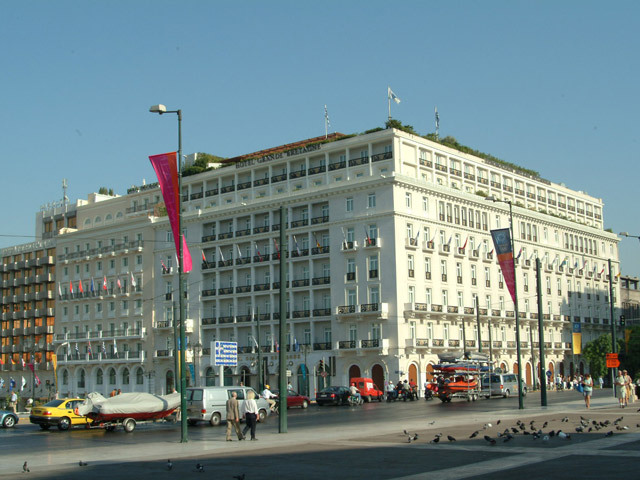 Wyndham Grand Athens hotel welcomes you, fully renovated, to a new haven of affordable luxury in the center of Athens. 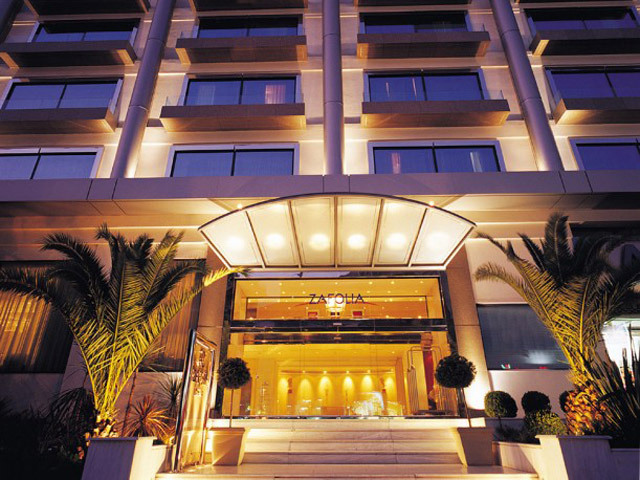 Conveniently located right next to Metaxourgeio metro station Wyndham Grand Athens hotel is the ideal starting point to explore every major attraction and significant landmarks within minutes. 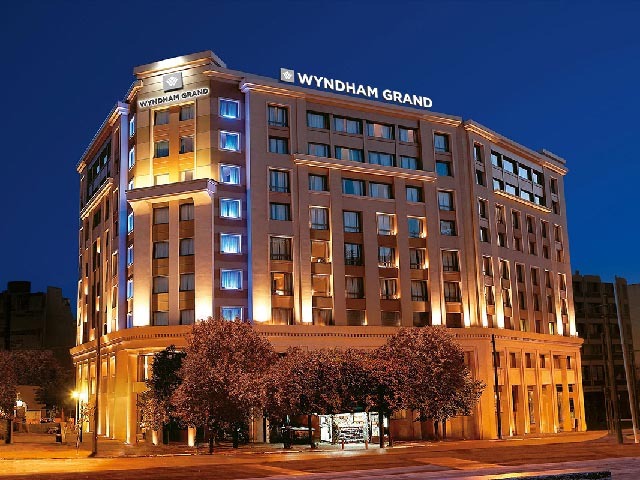 With 276 rooms and suites in 8 floors, Wyndham Grand Athens hotel offers a wide variety of brand new accommodations to suit single, couple or family needs for business or leisure travelers. In addition to its great locale, Wyndham Grand Athens hotel boasts exceptional Mediterranean and International cuisine dining options to delight your senses. 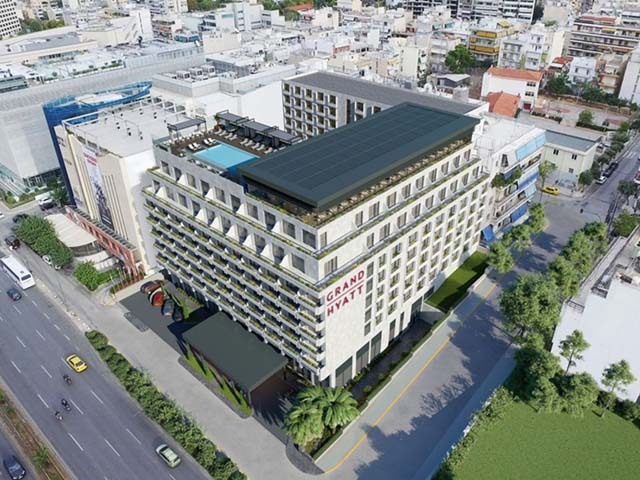 Wyndham Grand Athens is the only one of Athens hotels that offers 360 degree panoramic views of the Acropolis, Lycabettus hill and the Saronic Gulf from its impressive rooftop bar restaurant. Enjoy the breathtaking view with a refreshing cocktail or a delightful meal by our magnificent outdoor waterfall swimming pool. The hotel's spacious interior features 2.500 sq. meters of multi-functional conference and event spaces with a capacity of up to 2000 pax. Combined with state of the art equipment and a well-trained staff, your meetings, gala events or weddings are guaranteed to be a complete success. Free super fast Wi-Fi internet connection in all public areas and rooms accommodate even the most demanding online needs. If you're seeking rest and relaxation, and even a bit of pampering, our lovely spa center is at your service for facial treatments, full-body massages and much more. Stay fit & healthy in a fully equipped gym and feel rejuvenated with a sauna experience during your stay. We invite you to live the Wyndham Grand experience, indulge in our high quality service to the highest standards of Wyndham Grand Worldwide and become our best "ambassador". Ancient, proud but also modern and multi-cultural, there’s no end of monuments and attractions to see in Athens. Athens is a year-round destination offering many destinations. Begin exploring this fascinating city and soon you’ll be coming back for more! Luxury and comfort come standard in every room at Wyndham Grand Athens. The Standard Double Atrium View room features a king-sized bed, a functional working desk with Espresso machine and a spacious bathroom with luxurious bathroom amenities. Pillowtop mattresses and Egyptian cotton linens offer a comfortable, good night’s sleep and a free Super-Fast Wi-Fi keeps you connected. Select your favorite TV Satellite Channel in the LED LCD TV 43’’while enjoying our in-room special dining options. The window offers natural daylight from the hotel atrium and view to FOS Restaurant on the ground floor. Enjoy the comfort of a luxuriously furnished accommodation with unrivalled views of the city. In the Standard Double City View room, you’ll enjoy views of the down town city and maximum comfort in your king-sized bed with pillowtop mattresses and Egyptian cotton linens. With a stylish furniture design and a generous help of mirrors that visually double the space, as well as indirect lighting we try to make the most of the square footage while creating a relaxing atmosphere. The room also offers a spacious work area with Espresso machine and tea & coffee facilities, a spacious bathroom with luxurious amenities, a LED LCD TV 43’’ with Satellite TV channels and Free Super-Fast Wi-Fi. The Standard Twin Atrium view room can accommodate two single persons, with one twin bed with comfortable quilts for perfect sleep, a spacious work area with Espresso machine, tea and coffee facilities. Enjoy a refreshing shower in the spacious bathroom with colored mirrors and luxurious amenities and then lie down on your bed and select your favorite Satellite TV Channel in our LED LCD TV 43’’. Pillowtop mattresses and Egyptian cotton linens offer a comfortable, good night’s sleep while our Super-Fast Wi-Fi keeps you connected all day. In the Standard Twin City View room, you’ll be treated to picturesque views of Athens and enjoy a host of amenities designed to make you feel at home. With a few carefully focused details, clever and stylish furniture design and a generous help of mirrors that visually double the space, as well as indirect lighting we make the most of the square footage while creating also the most relaxing atmosphere. Amenities also include pillowtop mattresses, a working area with Espresso machine & tea and coffee facilities, a LED LCD TV 43’’and Super-Fast Wi-Fi. Make yourself a small gift by selecting your breakfast or lunch to be served in the comfort of your room. The spacious Executive Double City View room with a mix of proper luxury and casual atmosphere includes a master bedroom with a king-sized bed and view of the city. Amenities include pillowtop mattresses and Egyptian cotton linen sheets, a LED LCD TV 43’’ with TV Satellite channels and a working desk with Espresso machine, tea & coffee facilities. Stay connected with Free Super-Fast Wi-Fi connection and relax taking a refreshing shower with luxurious bathroom amenities in our playfully luxurious and yet chic bathroom. Welcome to the high life! The Executive Twin City View room offers a magnificent view of Athens and one twin bed with pillowtop mattresses and Egyptian cotton linens. The working desk has also tea & coffee facilities and an Espresso machine. The LED LCD TV 43’’ offers a variety of more than 80 Satellite TV Channels while the bathroom with luxury marble ceramic tiles and tinted mirrors are playfully luxurious and yet chic. Stay connected with Free Super-Speed Wi-Fi and relax selecting your favorite massage treatment in the comfort of your room. The Executive Double Acropolis View room offers all the amenities you expect from an executive room along with an impressive view of the Acropolis. The king-sized bed comes with pillowtop mattress and Egyptian cotton linens for a comfortable sleep. Luxury marble ceramic tiles and tinted mirrors make the bathrooms playfully luxurious and yet chic. Other amenities include a LED LCD TV 43’’, an Espresso machine, luxurious bathroom amenities and kids amenities, iron & ironing board and pillow selection. At night the golden lit Acropolis will keep you the best company for a restful evening while the city of Athens will be calling you to explore its famous nightlife. Guests in our Executive Twin Acropolis View room enjoy sweeping views of Athens’s most famous landmark in a spacious accommodation with one twin bed, a working space with desk and Free Super-Fast Wi-Fi connection. This guestroom room has one of the most preferential room views in Wyndham Grand Athens hotel facing from its large window the impressive Acropolis hill and the city of Athens. Pillowtop mattresses and Egyptian cotton linens offer a comfortable, good night’s sleep. Luxury marble ceramic tiles and tinted mirrors make the bathrooms playfully luxurious and yet chic. Select your favorite Satellite channel from our LED LCD TV 43’’ while preparing a hot coffee in the Espresso machine. 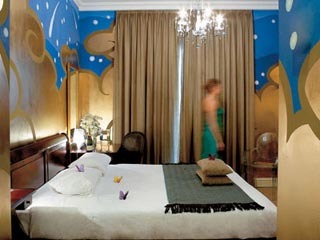 Feel like home and enjoy affordable luxury accommodation in the heart of Athens enjoying luxury amenities and services. With views of the city that can’t be beat, you won’t find a Junior Suite in Athens that offers the same affordable luxury and refined atmosphere as our own Junior Suite with city view. The kind-sized bed comes with pillowtop mattresses and Egyptian cotton linen sheets for a relaxing sleep. Α wooden carved partition separates the bedroom with the living room and has double use as a working desk on one side with tea & coffee facilities and an Espresso machine and two LED LCD TV 43’’ on both sides in order to be able to watch from bed but also from living room. The living room offers a comfortable sofa bed and easy chair with ottoman and has distinctive lighting. The spacious bathroom with colored mirrors and transparencies, offers shower and bathtub and luxurious branded amenities for adults and for kids. Free Super-Fast Wi-Fi keeps you connected at all times while you are enjoying the view of the city from the perimetric windows of the room. Grace and elegance go hand-in-hand in our Junior Suite with breathtaking Acropolis view. Designed and furnished for maximum comfort, this Junior Suite offers kind-sized bed with pillowtop mattresses, Egyptian cotton linen sheets for a relaxing sleep. The spacious living room is separated from bed area with a wooden carved partition which has in both sides two LED LCD TV 43’’ for undisturbed watching from bed but also from the living room. A comfortable working desk lets you catch up with your work while our Super-Fast Wi-Fi keeps you connected at all times. The living room with view to the Acropolis is the best place to relax or read with a comfortable sofa bed, an easy chair with ottoman and a modern floor lamp. Other amenities in the suite are an Espresso machine, coffee & tea facilities, pillow selection, iron & ironing board and branded bathroom amenities for adults and for kids. The bathroom has shower, bathtub and two washbasins with playful mirrors. Feel like a king in our Executive Suite with city view. With a few carefully focused details, clever and stylish furniture design and mirrors that visually double the space the Executive Suite includes 2 separate rooms. The one is a spacious bedroom with King-Sized bed, comfortable pillowtop mattresses and Egyptian cotton linens and the other one is a very spacious living room with comfortable sofa bed, an easy chair with ottoman and a modern floor lamp. The indirect lighting, the combination of warm colors in furniture and modern chic wallpapers create a “feeling at home” atmosphere and a heavenly escape from the city in the city itself. Among its luxurious amenities & services are a spacious working desk, two LED LCD TV 43’’, an Espresso machine, iron & ironing board, pillow selection and Free Super-Speed Wi-Fi connection in order to stay connected during all times. Luxury marble ceramic tiles and tinted mirrors make the bathrooms playfully luxurious and yet chic offering a bathtub, a shower and double washbasins and also luxurious branded amenities and kids amenities. Our executive suite is also the ideal type of room for a family visit in the heart of Athens and if you need even more space you can use the connecting rooms that extend even more the suite capacity. In the Executive Suite with Acropolis view our guests enjoy a wealth of amenities along with unobstructed views of historic Acropolis. The bedroom has a mix of luxury and casual atmosphere with a king-sized bed, a working desk and spacious closets. The living room is a separated area with a comfortable sofa bed, an easy chair with ottoman and a modern floor lamp. Both rooms have a LED LCD TV 43’’, modern furniture, warm colors in floors, fabrics & modern wallpapers and indirect lighting for a relaxing atmosphere. Other amenities & services include an Espresso machine, tea & coffee facilities, iron & ironing board & pillow selection, luxurious branded bathroom amenities and Free Super-Speed Wi-Fi connection. Luxury marble ceramic tiles and tinted mirrors make the bathrooms playfully luxurious and yet chic while they offer bathtub, shower and two washbasins. Pamper yourself by selecting our in-room private dining options with direct view to the lit Acropolis or Lycabettus hill or book a rejuvenating massage treatment in the comfort of your suite. The executive suite is ideal also for families for a shopping weekend and we also offer kids in-room dining options. High atop on the 7th floor, the Presidential Suite offers commanding views of the city, the Acropolis, the Lycabettus hill and the Saronic Gulf. Step inside a spacious living room with a meeting table, a comfortable sofa bed, armchair, easy chair with ottoman and a modern floor lamp. The separate master bedroom has a king-size bed with pillowtop mattress and Egyptian cotton linens, a working desk and spacious wooden closets. The indirect lighting, the combination of warm colors in furniture and modern chic wallpapers make you feel comfortable and relaxed. Among the amenities and services, you would expect from a five-star hotel’s most prestigious accommodation, are also two bathrooms -the one with bathtub, a luxurious Jacuzzi and double washbasin and the other with shower - two LED LCD TV 43’’, independent air-conditioning & heating, pillow selection, iron & ironing board, in-room safety box and luxurious bathroom amenities for adults and for kids. Services also include Free Super-Speed Wi-Fi internet connection to stay connected and 24-hour room service. To ensure your stay with us delivers all the comfort and convenience indulge in the finest amenities and services, planning a romantic dinner or a business meeting in the living room with unobstructed view to the Acropolis, or select one of our special massage treatments for a rejuvenating break. Live like royalty in the best Presidential Suite in Athens with different views of the city! “Fos” means “light” in Greek, a word that perfectly reflects the experience of dining in this naturally-lit, spacious restaurant. Whether you’re starting off your day with a hearty, delicious breakfast, enjoying a tasty lunch or indulging in an inspired a la carte gourmet dinner, FOS restaurant in Athens serves up delectable Mediterranean food throughout the day along with a rich selection of wines. Located in the atrium of the ground floor, FOS offers a pleasant ambience combined with high-quality and discrete service. At night the atmosphere becomes much more intimate, with soft lights & relaxing music, FOS is an ideal date night restaurant in Athens. Make your reservation and taste an unforgettable romantic dinner or a fruitful business lunch. With unobstructed views of the city, “Above” is the best roof top restaurant in Athens to get a mouthful of delicious food and an eyeful of amazing scenery, from the Acropolis to Lycabettus hill and all the way down to the Saronic Gulf! Enjoy signature cocktails while nibbling on mouthwatering tapas dishes and gourmet items from our a la carte menu, prepared and served by our expert staff. Lay back comfortably in your deck chair and sip on refreshing cocktails or cool off under the impressive waterfall in the most stylishly designed roof top pool bar in Athens. Our resident DJ will get you up off your stool and in the mood for some dancing, while our theme nights are guaranteed to inspire you for a bit of socializing. Nights come alive with the stars up above and the night-lit city down below at “Above” roof top restaurant Athens! The perfect place to relax and feel the vibes of the city. “Silk” is our all-day lounge bar on the ground floor and is the perfect place to enjoy your coffee in the morning, surf the internet with Free Super speed Wi-Fi, arrange business lunch or meeting in a casual environment or sip on your favorite evening drink. Silk lounge bar’s name has been inspired from the local history of Metaxourgeio, the old “silk-manufacturing” neighborhood of Athens. Here you can sit back and take in the lively rhythm of Karaiskaki square. Celebrating a special anniversary? Planning on popping the question? Longing for a special night of intimacy and romance? Whatever the occasion, at Wyndham Grand Athens you’ll experience the best in-room dining in Athens.